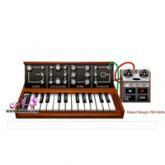 Google has marked the birthday of music pioneer Robert Moog by creating a 'Doodle' in the form of an interactive electronic synthesiser which can be played by clicking on its keys using a cursor. Although musical synthesisers already existed, Moog transformed pop music during the 1960s by producing and marketing a small keyboard synth which could be used with relative ease. Bands including the Beatles and the Doors used the Moog synthesiser, while others later became fans of the Minimoog, a stripped-down version which followed it in the 1970s. The pair started their own company in 1954 to sell theremin kits by mail order. After studying at the Bronx High School of Science, Moog attended Queens College before graduating in electrical engineering at Columbia University and earning a doctorate in engineering physics at Cornell. Of the Moog synthesiser, which appeared in 1964, the inventor was to later recall: "I didn't know what the hell I was doing. I was doing this thing to have a good time, then all of a sudden someone's saying to me, 'I'll take one of those and two of that.' That's how I got into business." Moog died in 2005 at the age of 71, after being diagnosed with a brain tumour four months previously. However, the Moog sound has lived on, with musicians such as Fat Boy Slim choosing to continue to use it even in the digital era.